Ohmygoodness, readers, I may be in love. I picked up this bad boy on Friday, and I’m not going to want to say goodbye. I used Aperturent.com to arrange my date; I picked up my new companion for a weekend away, and we had the best time. OK, fine. I’ll just explain so you don’t have to follow all my links (although I encourage you to check them out, since I did have such a good experience). 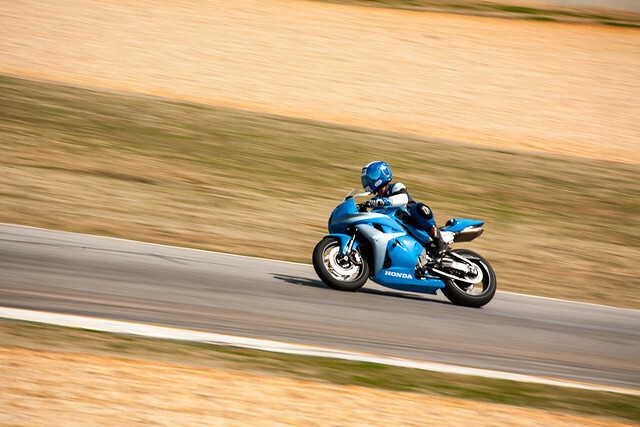 I’ve mentioned once before my husband’s um, shall we say fast paced?, hobby – he’s into the really fast motorcycles. 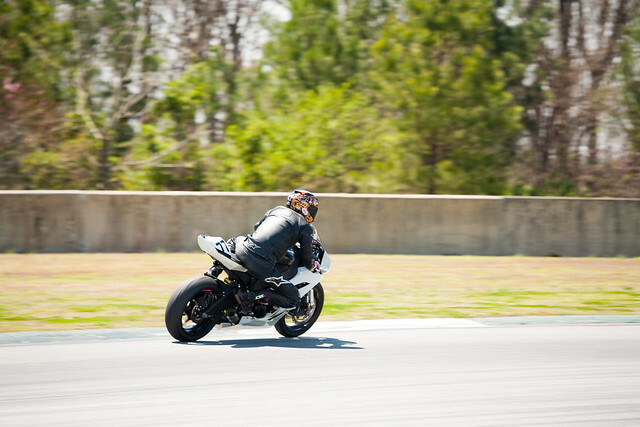 The good thing is that there is a safe outlet for that – because, trust me when I say you do not want anyone you care for to go that fast (Jacob’s top speed this weekend was 175 mph!) on the road. 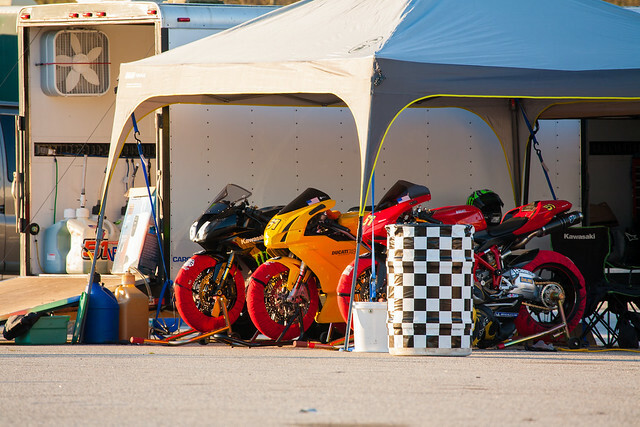 There are several organizations, such as NESBA and STT, that sponsor track days around the country so the speed demons among us can indulge their need for speed safely (well, saf-er, anyway). What does this have to do with my date this weekend? Well, most of the tracks are surrounded by fences, railings, barricades, etc to keep spectators off the tracks, and the riders in. And they’re road racing tracks, so they’re set up like a curvy road through woods, fields, etc. It’s hard to get close enough (safely) to take any decent photos. 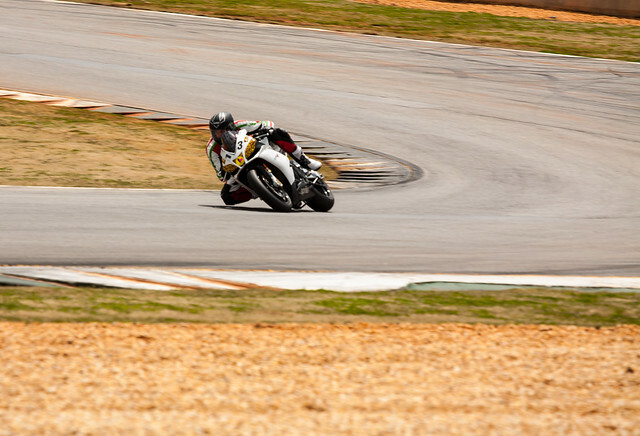 The track at Road Atlanta, where we were this weekend, is 2.54 miles long, but it’s set up very conveniently for spectators and, ahem, amateur photographers. There are roads all around the track perimeter and the infield so I could drive from one vantage point to another pretty quickly, but you still can’t get very close in most cases. My 24-70mm lens just wasn’t long enough to let me get very many good, dramatic shots. And thus, my date: I rented a Canon 100-400mm f4.5-5.6 L IS lens, and it was awesome. I was able to see far enough down the track to tell when my husband was coming so that I could set up and track his movements with the camera to get some really great action shots. And the lens was long enough to enable me to photograph from places that would have been too far for my 24-70mm to even make out who I was shooting. 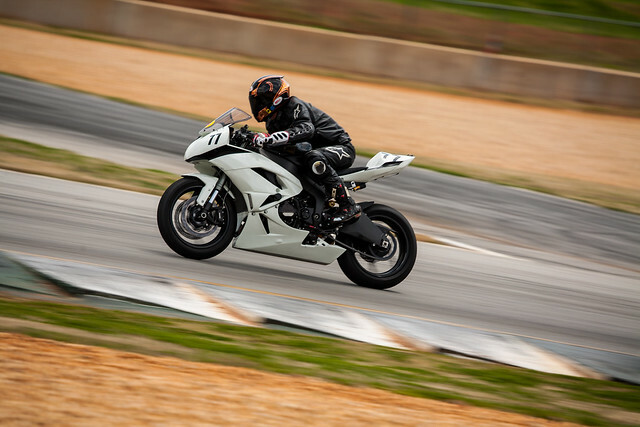 I really enjoyed being able to join in the track day fun – I don’t ride myself, so I’m usually along for the ride when we go, and it was really nice to have something interesting to occupy me while Jacob was out doing his thing. Do let me know what you think of these photos; you can find the whole set here on flickr, and I’d love some feedback. High speed sports like this aren’t the easiest thing in the world to shoot – I took 693 photos over two days; of those I kept 477, and of those I only chose 78 to edit and make into a collection. Trial and error, good equipment, practice, and a good amount of luck played a big part in getting any decent shots, and I thought I’d do a post in the next few days on the techniques and equipment I used. If you have any specific questions, just drop me a line. ohmgosh, a place to RENT camera equipment! Great pics too! I LOVE photography, we will have to chat sometime about it. Have a great day! I had a feeling you were going to love that lens! It’s one of my favorites 🙂 And you got some incredible action shots with it, especially considering you’ve never used it before! Panning a telephoto lens with a moving target is TOUGH. It really was awesome. I was worried about it being a “push-pull” type since I’ve never used that before, but I actually think that was an asset for high speed sports – it was much easier to zoom quickly with it. I’ll definitley be adding that to my wish list!